Listening To The Echoes Of Creation : 13.7: Cosmos And Culture Scientists last week revealed evidence of gravitational waves from the very beginning of the universe. Commentator Marcelo Gleiser asks: Are we closer to understanding creation itself? 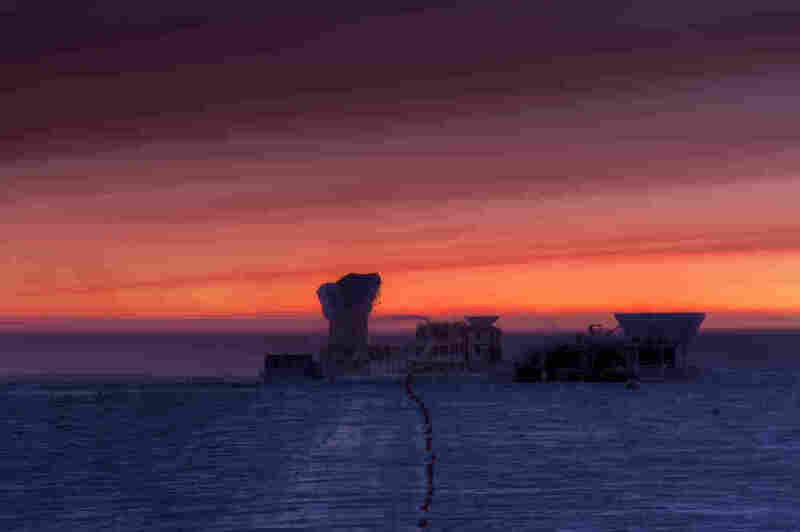 The National Science Foundation's South Pole Station, home to the BICEP2 telescope. Nine days ago, the unbelievable became believable as an enthralled scientific community heard the announcement of an amazing experimental result: For the first time, astronomers detected signals from events dating back to the origin of the universe. Scientists heard the first echoes of creation. But it all sounds absurd, doesn't it? How could it be possible to observe something that happened 13.8 billion years ago, the time of the Big Bang itself? In cosmology, the branch of physics and astronomy that studies the origin and evolution of the universe, data are gathered by scanning the skies for signals, searching for clues from a very distant past. Not unlike paleontologists, who reconstruct dinosaur bodies like a puzzle from bone fragments, cosmologists search for radiation, particles, anything that will tell them about cosmic history. We don't think about the Big Bang like we used to. Before, some 40 years ago, the Big Bang was an initial state of impossibly hot matter and radiation concentrated in a tiny volume. This situation, being untenable, would lead to a release, where matter and radiation would expand outward. The twist, and complication, was that space itself was contingent on this primordial stuff, so that as matter unwound, space grew. We didn't (and still don't) know what kind of matter that was. But we do have fossils that indicate that the universe was indeed very hot and dense early on. In 1981, this scenario underwent a complete revision. Alan Guth, a physicist from MIT, knew there were problems with the Big Bang scenario. (Others did too, but it was Guth who saw the way out most clearly.) Guth suggested that the universe went through a very fast and short-lived period of ultrafast expansion, an inflation of space, so to speak. If fast enough, such inflation could explain many things the old Big Bang scenario couldn't; for example, why the geometry of the universe is so flat. (In principle, it could be curved, like the surface of a sphere, or a Pringles potato chip, but in three space dimensions, hard to see.) The key point is that a small patch on a fast-growing balloon will quickly look flat. Guth's idea was that we live on this flat patch. Since then, and after the 1990s, we have collected indirect evidence that something like inflation did take place: the universe does seem to be flat. Another signal comes from the so-called cosmic microwave background, the leftover radiation from the epoch when the first atoms were being made, some 400,000 years after the bang. Before then, a fierce love triangle locked protons, electrons and photons, the particles of light. Every time protons and electrons tried to embrace to make a hydrogen atom, a photon would interfere, kicking the electron away. But at about 400,000 years, the universe had cooled enough for photons to become weaker; eventually, they lost the battle and were doomed to roam aimlessly across space. These photons are the cosmic background radiation. Today, 13.8 billion years after, they are cold and weak, and have wavelengths of microwave radiation. Inflation predicts that such photons have both a very uniform temperature (at about 2.75 above absolute zero. And you thought that this winter was cold!) and tiny fluctuations about it of only 1 part in 100,000. These fluctuations were measured by NASA's Wilkinson Anisotropy Probe and, more recently, by the Planck satellite of the European Space Agency. But inflation predicts something else: In the violence of the fast expansion, space itself would ring, as when you throw a stone on the surface of a lake. Actually, the waves during inflation — gravitational waves — have a more complicated pattern. But the idea is the same: A disturbance in the matter fields filling up the cosmos creates a disturbance in the geometry of space and vice versa. The pattern of interest here is a kind of twist in space, a bit like that around a hurricane. It was this signal, the twisted gravitational waves created during the inflationary expansion, that was measured by the BICEP2 team and has caused such a stir. This signal was created a mere trillionth of a trillionth of a trillionth of a second (10-36 seconds) after the Big Bang. Before then, the closest signal to the Big Bang was at about 1 second. How could such a thing be measured? Gravitational waves travel through space practically unimpeded, causing tiny fluctuations in the distribution of matter and radiation, somewhat as if the ground beneath your feet vibrated. Eventually these waves clashed with the photons from the cosmic background radiation. Just as beach waves leave an imprinted pattern on the sand, these gravitational waves left their twisted signature on the microwave photons. This is the pattern that scientists working at BICEP2 detected. Such a remarkable discovery will have to sustain significant scrutiny by the scientific community to hold true. After all, the trademark of science is that you want to make sure your measurements don't fool you: Seeing is believing, but this seeing must be foolproof or, at least, as foolproof as possible given our tool set. Fortunately, other experiments are going to probe the same wavy twists soon and we should have either confirmation or refutation by the end of the year, if not sooner. Let's consider the enormity of what this could mean. Here we are, in the early decades of the 21st century, making measurements that take us back to the very first instants of creation. Even if the measurements from BICEP2 prove to be incorrect, they still show that we can probe the very birth of the cosmos. Let us assume that the results are correct and inflation did take place. Inflationary theory redefined the whole notion of the Big Bang. Now, it's not really the explosive beginning of time but the explosive release of energy that marks the end of the ultrafast expansion. Inflation offers a model for the Big Bang itself! But it doesn't solve all problems (nothing does); we still don't know how this release of energy is properly converted into particles. And, more problematically, we also don't know how inflation was triggered. What put the universe in that privileged state of fast expansion? This is known as the "initial condition" problem. And it's not new. It has been called the problem of the "First Cause" before, one that does give us headaches, unless you go for supernatural causes. But of course, within a scientific description of Nature, supernatural causes won't do. The current solution, that our universe is one among many (infinitely many?) other universes, or part of a multiverse, brings up all sorts of issues that we will explore some other time. To some, it elevates the problem of the First Cause from a headache to a major migraine. At this juncture, we can say that despite our progress, creation is still hiding its face from us.